Four medical appointments (endocrine system, eyes, teeth, skin), two indoor bike rides on Big Nellie, two outdoor bike rides on Little Nellie, a visit to the gym, five yoga sessions (on my own) (Did I mention I hate yoga.) A return to meditation after several months. One WABA event followed by a WABA happy hour. And Friday Coffee Club. Also, I stealthily bought Mrs. Rootchopper flowers for Valentines Day. And we went out to dinner. I started doing yoga again because my body is a wreck. I suspect part of the reason it is a wreck is that I’ve gained about 20 pounds since last summer. My left knee, hip, lower back, and arm are all messed up. And very painful. My thighs feel like they are made out of concrete. So the yoga I am doing is very basic and emphasizes freedom of movement. My routine also includes PT exercises for iliotibial band syndrome (which I think may be behind the knee and hip pain) and runner’s calf stretches. I’ll give it another week before I go to my doctor and raise a white flag of surrender. The last thing I want to do is get on the medical hampster wheel again. Next week promises to be busy as well. Breakfast with Mrs. Rootchopper at a diner on Thursday, an every other week thing. I suppose I could be cavorting in Antarctica or Munich or some other far away land. But I’ll leave that to the young folk for now. In a couple of weeks, the Crystal City Garage Bike Races begin. If you are in DC and want a cheap (i.e. free) night out, you should come. Three weeks ago my medical crisis began. Today was a normal day like any other with the minor exception that I rode in the basement rather than outside. If I didn’t know any better, I’d say I was healthy, well adjusted person. Okay, let’s settle for healthy. We can’t expect miracles. I was a busy boy today. I made two appointments for scans ordered by my pulmonologist, helped arrange for the appliance guy to come fix our dryer, drove to Marlow Heights to get a second key for the Millennium Falcon, my son’s rattle trap of a car, and drove to REI to try on new shoes. (I didn’t like them.) Then, after a meditation break along the river, it was back home to find out I needed to make another scan appointment. Yesterday’s ultrasound didn’t give a clear enough view of my adrenal gland so we’re doing another CT scan. (Certain cancers cause an increase in clotting so the search is on to find or rule out cancer somewhere in my body.) Next up was a 13 mile ride in the basement while reading my book. (It’s called Ramp Hollow. It’s about how the people of Appalachia came to be in their socio-economic predicament.) Finally, I did my complete set of physical therapy exercises including a shoulder stand. I don’t want to jinx anything, but I feel pretty normal. The only real way I can tell is to try to do more normal things and see what happens. So I need to take a bike out and ride it somewhere. I suspect that if I can handle 20 miles outside on my Cross Check I’m doing just fine. If I can go up a hill without dying (not literally, I hope) that would be another milestone. Still another test will be to go to the gym and lift weights. I am not Ahnuld so this is more to see how my heart reacts to pumpitude. Anyway, feeling somewhat normal is pretty flabbergasting to me. It’s been three weeks since the clots decided to go site seeing in my lungs. I felt truly awful for the first week after the pulmonary embolism(s) came to play. Since it came up in a recent twitter conversation, I should point out that I plan on riding while on blood thinners. Nothing heroic or adventurous just my usual everyday cycling. With a helmet on, of course. For the short term, I just want to see where my fitness (and balance) is. For the long term, I need to be active or I will lose my mind. (Just ask my wife.) How all this translates to bike tours and events is TBD. I also intend not to let this medical mess turn me into a hermit. In addition to seeing plenty of medical professionals, I plan on going to several non-medical events in the weeks ahead. 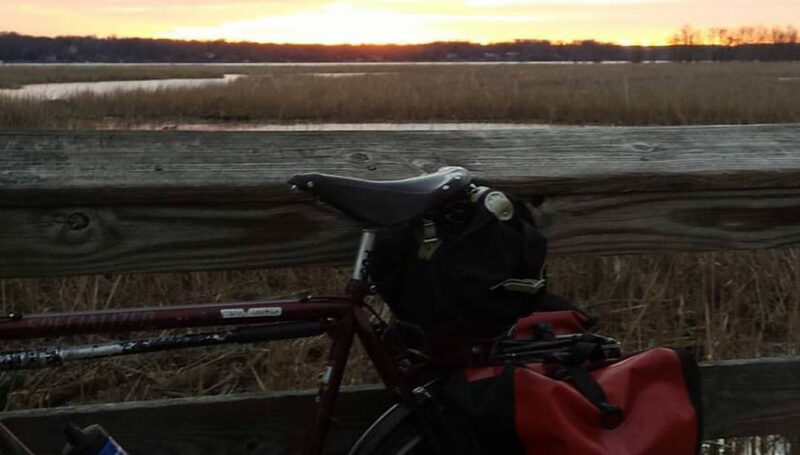 There’s a wedding on Saturday, a #bikedc happy hour next week, a meeting with the National Park Service about the Mount Vernon Trail the following Saturday, and the WABA Awards get-together in a few weeks. I doubt I’ll ride to these events. There will be plenty of time for riding when it’s warmer and lighter out. Lord willin’ and the clots don’t rise.